Here we see Heston Heights Middle School for the first time, slightly modeled after Jackson High School in Jackson, MI. I liked the gothic architecture of the building – something kind of old school. There’s just something awesome about a big old school building. 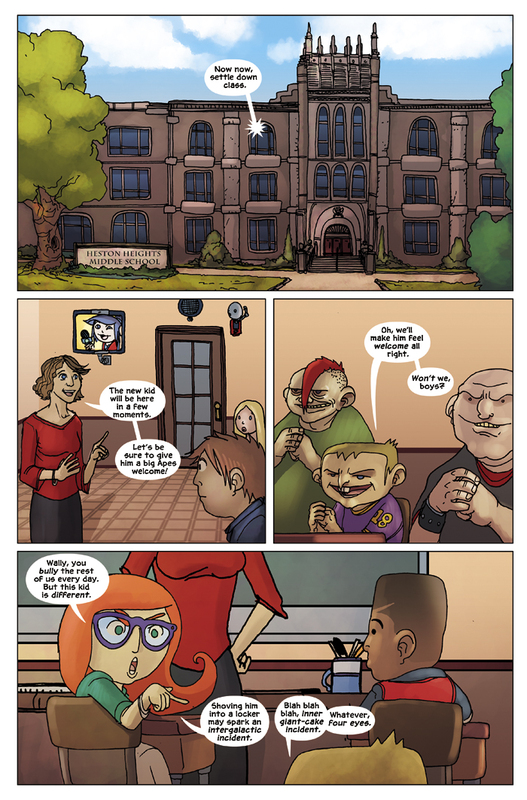 We will likely be modernizing the school throughout the series, however in it’s current state it’s pretty normal. 1) Gerty Greyson – who will become one of the main characters moving forward. She’s a little nerdy, but also not afraid to stand up for her friends and voice her opinions. 2) Wally McNally – the school bully, and all around mean kid. We also see the teacher, which was one of our sponsor spots auctioned off on our facebook page before the comic went live. The teacher is actually retired middle school language teacher Joyce Vivirski! We will be announcing several other paid appearance opportunities for the second issue soon, so be sure to “like” the facebook page and stay tuned for updates. So if you (or someone you know) would like to appear in an issue of Albert the Alien, we can definitely make that happen. However, appearance opportunities are limited – so be sure to act fast when they pop up. Gabe and I are prepping for C2E2 this weekend in Chicago. If you’re coming to the show, be sure to swing by the Reading with Pictures booth (1330) in the small press area and say hello! Trevor and Gabe will be attending C2E2 this weekend in Chicago! They are manning the Reading with Pictures booth (#1330) again, selling copies of the anthology (as well as Albert the Alien and Junkyard Chase). They will also be doing a live reading on Sunday on the Variant Stage from 1:15-2:15pm, showing off some of the new RWP volume 2 material. Including the brand new Albert the Alien story specifically written for this new Graphic Textbook. There will be a lot of fun and exciting things going on, so we hope to see you all there!